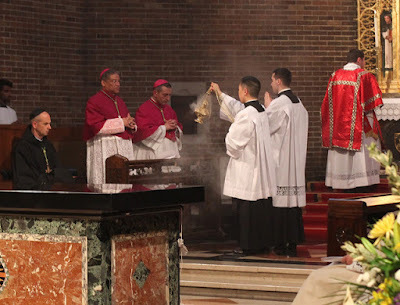 At the Solemn Vespers held on the opening day of the Sacra Liturgia conference, June 1, 2015, I witnessed a memorable sign of the true nature of the Church and of the cosmos: the elaborate incensation during the Magnificat. 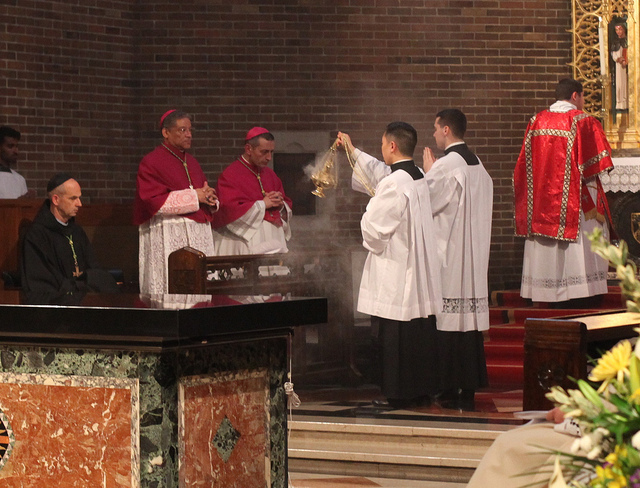 I have seen incense used at Vespers before, but never so elaborately, or, one might say, to such a Baroque extent (with “Baroque” as an altogether laudatory appellation). After all, incensing, like every sign used in worship, must be done properly, according to the order of persons involved — and we had in our midst a major prelate at the throne, His Eminence Raymond Leo Cardinal Burke; several bishops and an abbot; ranks of clergy; platoons of religious, seminarians, and laity. It was a microcosm of the Church universal. Christ offers the very source and norm of ecstatic being within the order of hierarchy. Finite, hierarchical being now shows itself as a being through which we stand within ourselves as outside of ourselves—offered up, or given over, in sacrifice. . . . To die with Christ (and thus to be saved) is to become an offering through fire, a burnt sacrifice. The desire that burns within all hierarchical beings is the fire of holocaust, in which those beings are offered ecstatically to their source. Such an offering ignites the true movement of death, realized first in Christ and offered through Christ for imitation. Christ saves the finite being whose very identity consists in self-transcendence. Taking one’s time with an action like this gives it its full weight. There are no excuses or apologies for the lengthy ceremony. No one is in a rush; no one’s private agenda is permitted to dictate that we must get done as quickly as possible. 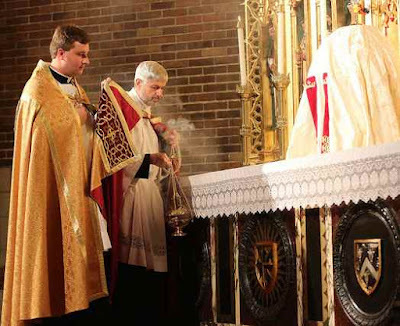 If individuals need to come and go, they are free to do so; but the liturgy proceeds on its own time, in its own domain, with a blessed freedom and a sort of holy indifference to the world. Spurning the utilitarianism of our time, we should not want to “get things over with” as quickly as possible, so that we can get back to our oh-so-important secular lives; and the liturgies in New York City taught us that preeminently valuable lesson. The world is tearing itself apart in a demonic frenzy of self-indulgence, envy, and violence, and we cannot stop it from lying and killing, for its father is the father of lies, and a murderer from the beginning (John 8:44). But we can do the one thing for which we were made: praise, adore, glorify, magnify the Lord, for His own name’s sake, and for our salvation. This is why our Lord Jesus Christ came into the world: to save sinners, of whom I am the first (1 Tim 1:15). This is why He ascended into heaven: that, in spite of the world, the flesh, and the devil, we who are His faithful disciples would follow Him heavenward in our thoughts, desires, actions — above all, in the theandric action of the liturgy, which joins man to God, earth to heaven, sinner to salvation. I saw this throughout the conference liturgies: each was of a mighty stature that seemed to be a slice of the eternal motions of the heavens, or like a living thing breathing on the scale of the redwood forests or the ocean reefs. We were catching a glimpse of something far greater, far more ancient and at the same time well ahead of us and beyond us, into which we were permitted to enter for a time, as a gracious favor. 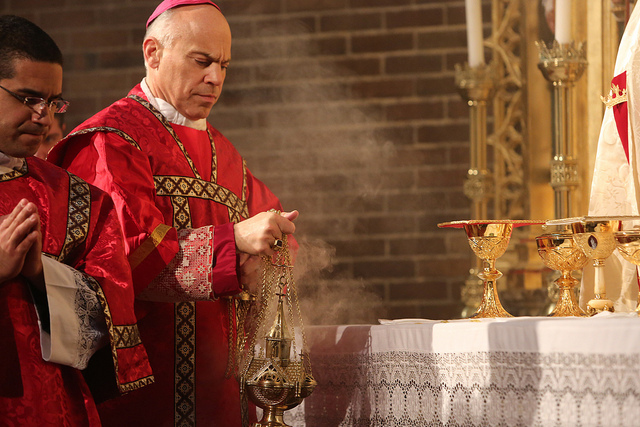 The liturgy was what it had to be and we submitted our minds and hearts to its rhythms, its logic, its mysteries. God was present and we served Him. That is all — and that is enough to make everything else real and worthwhile. Near the conclusion of an absolutely sublime Votive Mass in Honor of the Holy Angels (in the usus antiquior), I was struck by the paradox of the Postcommunion prayer: “We who are filled with the heavenly blessing humbly beseech Thee, O Lord, that the mysteries we celebrate with this poor worship [fragili officio] of ours may be profitable to us by the help of Thy holy angels and archangels.” This — all that we had just done, all the glorious music, the noble prayers handed down to us by countless saints, the very offering up of the Holy Sacrifice in a church filled with worshipers in rapt and adoring silence — was our poor worship? And yet, it was a poor service compared to the bright, sleepless, ecstatic worship of the angels in the heavenly Jerusalem, compared to the perfect intercession of the wounds of Jesus Christ in His divine humanity at the right hand of the Father. But it took the very splendor of this liturgy to throw into bold relief the distance between us and the ineffable vision of peace for which we long. Thomas A. Carlson, Indiscretion: Finitude and the Naming of God (Chicago: University of Chicago Press, 1999), 173-74. Commentary on the Song of Songs, Sermo III, Corpus Christianorum, Continuatio Maediavalis, Vol. XVII, 48; courtesy of Sancrucensis. Photos courtesy of Stuart and Jill Chessman/Sacra Liturgia.